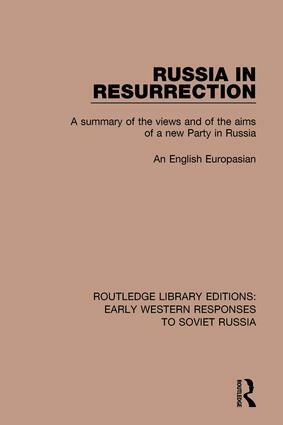 Originally published in 1928, this volume examines the idea of being Europasian - that is Russia's uniqueness as a country belonging to and influenced by both Europe and Asia. The book is divided into 3 parts: the first outlines unwesternized Russia and argues that the land, her races, history and culture up to Peter the Great are Europasian. The middle part discusses the weaknesses of the Imperial Regime and the chaos of Bolshevik rule. The final section gives an outline of the Europasian movement and its economic and political programme.